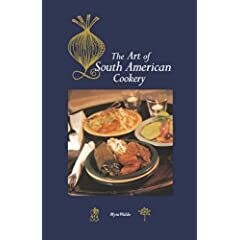 RECIPE TITLE "Marinated Peruvian Swordfish Brochettes (Anticuchos de Pescado)"
In Peru, the word anticuchorefers to the unbelievably tasty skewers of beef heart--marinated in cumin, garlic, chile, and vinegar--grilled on braziers on most street corners. However, anticuchos are also made with chicken or meaty fish, such as bonito or swordfish. 1. Soak eight short bamboo skewers in cold water for 1 hour. 2. With a mortar and pestle, pound the garlic and salt to a paste. (Alternatively, you can crush the garlic in a press and stir it into the salt.) Transfer the mixture to a glass bowl and add the cumin, paprika, chile, lemon juice, and vinegar. Add the fish, toss to coat it with the mixture, and marinate for 30 minutes in the refrigerator. Remove the fish from the marinade and shake off the excess. Reserve the marinade. 3. Prepare coals for grilling or preheat the broiler. Thread the fish on the skewers and brush it with the olive oil. Grill until the fish is lightly charred and cooked through, 4 to 5 minutes per side. 4. While the fish is grilling, place the reserved marinade in a small skillet with the annatto oil, and set it over medium heat until it sizzles, about 3 minutes. 5. Remove the fish from the grill, brush with the hot marinade mixture, and serve at once.